The recipe for this impressive pizza with a unique crust comes from Cooking Light and is only 9 points+ for a very generous piece! ( 1/8th of a 9 x 13" pan!!) 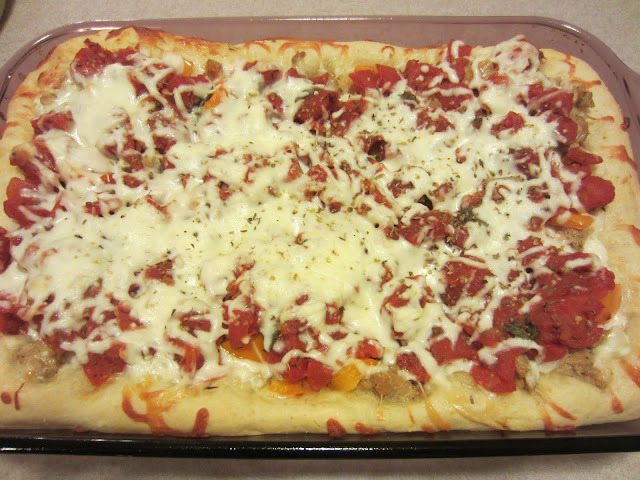 Loaded with cheese, sausage, onion, peppers and tomatoes, it was a huge hit with my family and it will be with yours too! 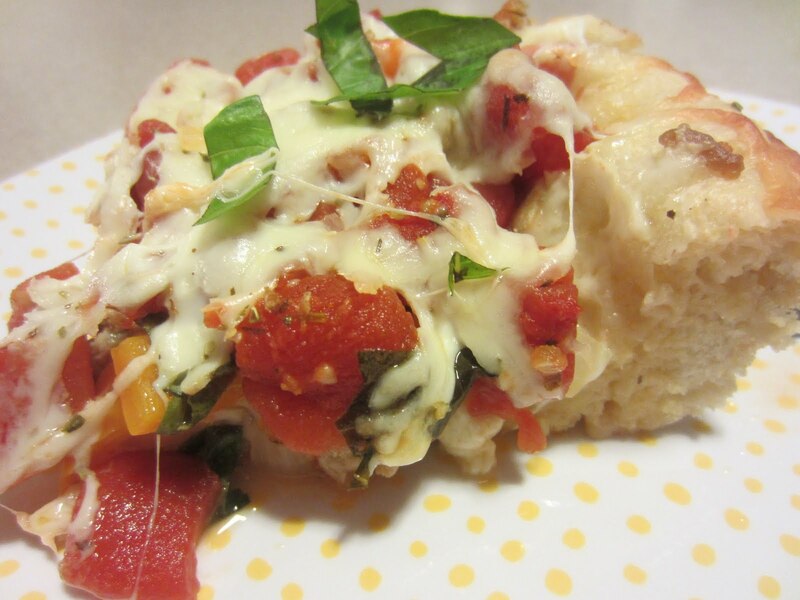 The crust is hearty and chewy with cornmeal added right into the dough. Made in a glass baking dish it is super simple to assemble and the forgiving dough is a breeze to make. Just give yourself enough time for the dough to rise ( about 45 minutes) and you are good to go. I served it with a huge veggie salad for a completely decadent meal. The original recipe called for mushrooms instead of onion, but I didn't have any on hand and my little guest is NOT fond of mushrooms, so I subbed onion. I think you could do whatever toppings you like, as this crust is able to stand up to MANY toppings and still hold together. 1. To make the dough: Dissolve sugar and yeast in warm water in 2 cup glass measure or small bowl; let stand for 5 minutes to get bubbly on the top. Stir in olive oil. Weigh ( 11.25 ounces ) or lightly spoon flour into dry measuring cups, level with a knife. Combine 11.25 ounces ( about 2 1/2 cups) flour, cornmeal and salt in a large bowl. Stir yeast mixture into flour mixture to form a wet ball. Turn dough onto lightly floured surface. Knead until smooth and elastic( about 5 minutes) slowly adding the remainder of the flour as you knead. Dough will be a little sticky. Place dough in a large bowl coated with cooking spray and cover. Allow to rise for about 45 minutes in a warm place until doubled in size. Punch dough down and let it rest for 5 minutes. Roll out dough on lightly floured surface into a 11 x 15" rectangle. Spray 9 x 13" glass baking dish with cooking spray. Lay the rolled out dough into the baking dish and press up sides. 3. To assemble pizza: Open the can of tomatoes and drain in a colander for about 10 minutes to remove most of the liquid. ( you can get the rest of the toppings going while the tomatoes are draining) Spread 1 1/2 cups cheese onto the prepared dough. Top the cheese with the sausage. Heat a large nonstick skillet sprayed with cooking spray to med heat. Saute the onion and pepper until they are tender, about 6 - 8 minutes. Top the sausage with the cooked vegetables. Top the vegetables with the drained tomatoes. Top the tomatoes with the remaining cheese. 4. Bake at 400 degrees F for 25 - 30 minutes or until crust browns and cheese bubbles. Top with chopped fresh basil. Cool 5 minutes before cutting. This really was a super yummy dinner! I will definitely be making this again. I loved the thick crust and the fact that you could make it in a common sized pan. I think I will be playing around with toppings next time. That is the fun of making pizza, right? The toppings! 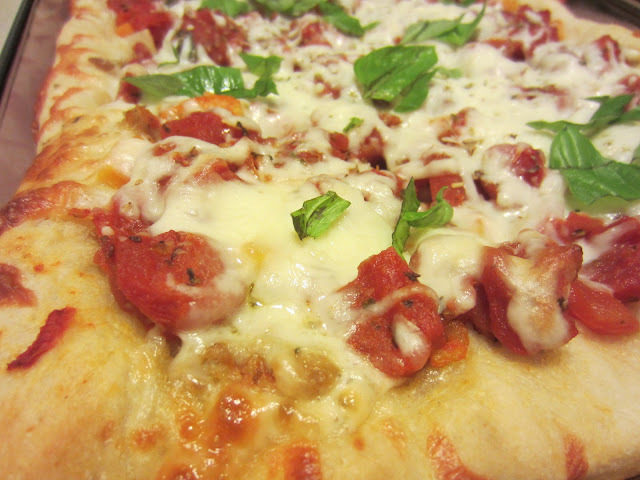 :) What are your favorite pizza toppings?? I did weigh out the flour when I made the dough. I find that when making yeast dough recipes, this really works out best because flour can weigh different amounts according to the humidity in the air. If you have a kitchen scale ( and most of us who do WW do) it is easy to use it for this. Just set your bowl on top of the scale and zero it out, then spoon the amount of flour you need for a recipe until you get the to the right weight! On a side note: Did you hear about the study that found ppl who follow WW lose twice as much weight as those who are just following a doctor's plan? EXCITING! You can read about it HERE. Looks perfect! Im not a mushroom fan either, so i prefer your version! I like tons of veggies on my pizza. Healthier deep dish? Count me in! As a Chicagoan, how can I not love this recipe? Hi Renee. Do you deliver? If so, I'd like to order a few of these. One for now, and some for the freezer... Hope your weekend is going well. All the best for the week ahead. Mmmm... I love pizza in any way, shape, or form! I did hear about that study on the news.... how cool is that?? Holy Yum! That look so good! What is this about your husband rarely compliments your cooking? Your food always looks amazing so he really must be a picky eater! He doesn't know how lucky he is! I made a deep dish pizza from Cooking Light but it wasn't this one, I must give it a try. I like Canadian Bacon and pineapple on mine! That pizza is fabulous! I just love all the fresh toppings right out of my garden. It is going to be so good. Hope you are having a wonderful week and thanks so much for sharing with Full Plate Thursday. This looks fabulous. I'm like a teenage boy, I could eat pizza everyday without problem, and I love a good crust!